A DRAW, a thriller and a belting made sure the South Australian Women’s Football League (SAWFL) had plenty of varied results on the weekend in just three games. Adelaide University: S. Walker 2, M. Zander, R. King. Christies Beach: T. Eastwood, T. Power , C. Cavouras. Adelaide University have drawn level with Christies Beach after a sensational nail-biting six-point win over the second placed side. Christies Beach booted two goals to one in the first term, and lead by five points at the main break. After half-time however, Adelaide University booted the only two goals of the half, taking control and restricting their opponents to just one behind. Stephanie Walker booted two goals, while Matilda Zander and Rachel King both kicked a goal for the winners. For Christies Beach, Czenya Cavouras was named the team’s best and booted a goal, along with Tallara Power and Taylah Eastwood. Teenager and South Australian Under 18s captain, Esther Boles was named among Adelaide University’s best, with Cassandra Tsoumbris and Nicole Collie. Morphettville: L. Buchanan 3, T. Meyer, L. Whiteley, A. Moritz. Salisbury: K. Rosenzweig 3, A. Woodland 2. Morphettville Park have come from behind with a fantastic three goals to zero final term to steal two points from Salisbury in a thrilling finish to their Round 13 match. While Morphettville Park have locked up top spot, it cost Salisbury third position, after Adelaide University recorded a win in its match. Lauren Buchanan booted three goals for the winners and was the difference on the day for Morphettville Park, while Angela Moritz, Tahlia Meyer and Lisa Whiteley also found their way onto the scoreboard and were named in the best, as was Ellie Kellock. 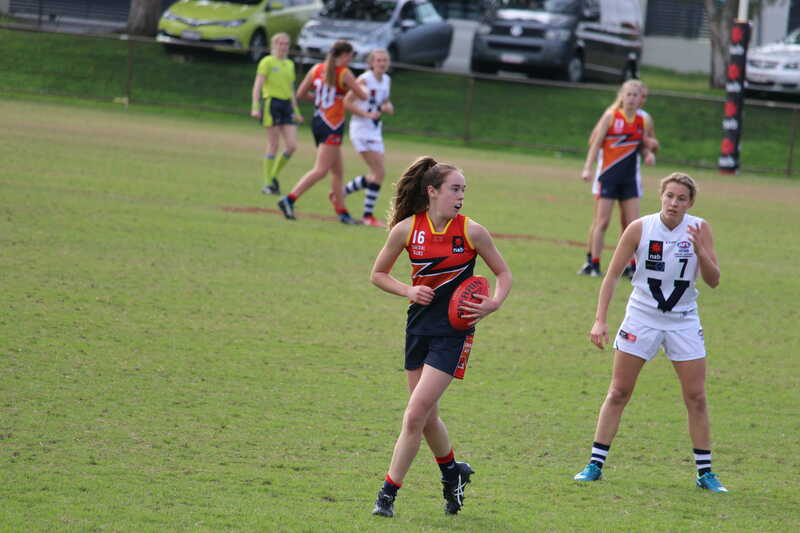 For Salisbury, Katelyn Rosenzweig continued her strong form upon returning from the AFL Women’s Under 18 Championships, booting three goals, while Ashleigh Woodland nailed two majors. Both players, along with Shae Gundlach were named in the best. Fitzroy: C. Biddell 4, M. Rich 3, R. Martin 3, H. Martin 3, M. Elsegood 2, I. Parkin 2, M. Newman. Fitzroy had a percentage-boosting win over Port Adelaide, piling on 11 goals in the second half to run away with a 112-point victory. The Lions restricted the Magpies to just the one goal for the game, while having 31 scoring shots in an impressive display. Fitzroy had five multiple goal kickers in the win, with Chelsea Biddell‘s four-goal best on ground performance the clear standout. Megan Rich (three goals), Isabelle Parkin (two) and teenager Rachelle Martin (three) were also busy on the scoreboard, while fellow Central Allies representative Madison Newman booted a goal in the win. For Port Adelaide, Ashlee Gould was the sole goal kicker, while Jessica Greet, Lauren Beck and Jessica Macolino were the Magpies’ best in the loss. LAST weekend’s action threw up highlights we are rarely treated to; with bags of goals, junior talent rising to the top, a pesky pigeon, and a classic after-the-siren win all headlining what was a memorable round of footy. 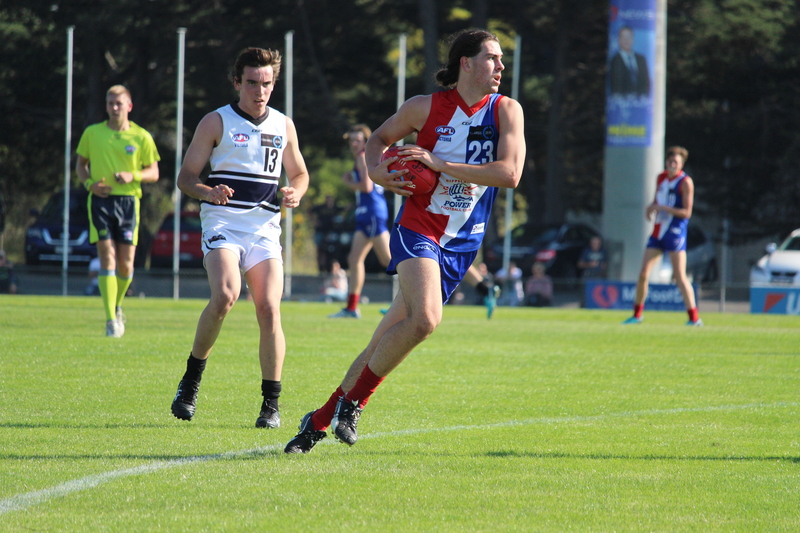 Noah Gown claimed the goalkicking honours in Round 12b of the TAC Cup, with his bag of five helping second-place Gippsland to back to back wins against top four opposition. His five straight majors came from an impressive 18 disposals and seven marks, with four goal assists coming to-boot. Having played all 12 games for the Power this season, Gown has built nicely into the year with 15 goals, and a rich vein of form lately seeing him named in the best for his fourth consecutive outing. Others to contribute on the day were Austin Hodge (25 disposals, six tackles, two goals) and bottom-ager Harold Hood, who continues to impress as he had 21 touches, eight tackles and five marks. Fresh off her Most Valuable Player (MVP) performance at the AFL Women’s Under 18 Championships, long-touted possible number one pick Maddy Prespakis turned on the heat at VFLW level. Against more mature bodies and experienced players, Prespakis put on another phenomenal display and stood as the only player across the competition in Round 11 to notch over 30 possessions. The next best for the battling Melbourne Uni side was Danielle Hardiman who had 15 disposals, while Alison Drennan managed 28 for the opposition. Prespakis’ 33 touches included 25 kicks and a goal, highlighting the Calder star’s damaging style from midfield. The performance came in only Melbourne University Womens’ third win for the season, with their three-point triumph bringing them within four points of seventh-placed opponents Southern Saints. Scott Pendlebury has shown over time that there’s not much he can’t do on a football field, but he added another feat to his list of exploits on Saturday. The Collingwood skipper paced into space with ball in hand, opting to take a bounce – but an MCG visitor had other ideas. With the ball thrown down in what seemed like slow motion, it collected a rather unlucky pigeon, yet managed to bounce obediently back up to ‘Pendles’ as if nothing had ever happened. Thankfully, the pigeon flew away without harm, probably starstruck by the Collingwood champion. The moment of madness came in the Pies’ comprehensive 66-point win over North Melbourne, which helped them to nestle inside the top four as the race for spots heats up. 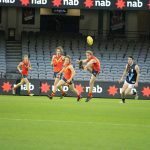 DESPITE some of South Australia’s top talent missing this week for the AFL Academy game in Melbourne, there were several standout performances across all competitions on the weekend. There was a real spread of highlights across the league, one of which being a huge goal haul from Glenelg’s Terry Milera, who booted seven goals in their narrow loss to Port Adelaide Magpies. Last year’s Under 18 state representative players Brad McCarthy and Alex Martini impressed also for Glenelg. For North Adelaide, former Crow Keenan Ramsey dominated their match kicking six goals in a massive win for the Roosters, and former Prince Alfred College student Mackenzie Slee made his League debut for the Roosters as well. Glenelg dominated Port Magpies and Lachie Hosie booted eight goals for the Bays, with last year’s South Australian state member Sam Davis was also amongst the best collecting 16 disposals and two goals. North recorded another win, and once again Frankie Szekely found the scoreboard. 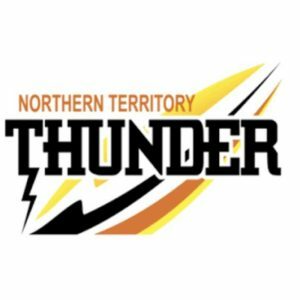 Norwood’s Cole Gerloff has impressed over the first two rounds along with South Adelaide’s Nathan Kreuger, who was again prominent in the Panthers’ narrow loss. Central dominated the Eagles in their match, and youngster Jez McLennan was not out of place. Ball magnet and 2017 South Australian state member James Rowe collected 29 possessions and two goals in a losing side. Glenelg kicked away against Sturt, and country lad Seb Schreiber was a standout through the whole game with 26 possession and seven rebounds. Finn Betterman was also strong throughout the match in a range of positions. Mihail Lochowiak was solid again with two goals from 24 possessions, but Sturt ruckman James Braidwood caught the eye with 14 contested possessions and 26 hitouts. Father-son Casey Voss was again in the best with six rebounds over the game. North accounted for West Adelaide by 23 points with James Langley’s three goals and seven marks making him an easy best afield candidate. Boyd Woodcock’s game high seven tackles and five clearances were impressive. The Bloods’ Beau Nunan hit the scoreboard with four goals, while Ethan Moore and underager Jye Sinderberry were both contributors. South Adelaide had a 15-point win over Norwood, and Tom Sparrow’s 14-possession, seven-tackle game was exciting alongside father-son prospect Hayden Sampson who collected 25 disposals. Dylan Stephens and Cameron Taheny were both best for the Redlegs and both are underage 2019 prospects. It was the Centrals and Eagles game that produced the standout performance with Malachai Ahmatt-Lovett booting se seven goals, earning him the Round 2 Under 18 Most Valuable Player award. Aaron Nietschke also collected a game high 26 possessions in their side’s 22-point win. Kysaiah Pickett was named in the best for Eagles as an underager along with 2018 South Australian Academy member Jarrod Miller who collected eight marks and five clearances. The last minor round of SANFL Womens competition was completed at the weekend with dominant side South Adelaide finishing as minor premiers. South will be hard to stop for the Premiership but North Adelaide will be reeling after losing their last minor round game. Some standout performers over the second half of the year have come from North Adelaide’s Britt Perry, West Adelaide’s Rachelle Martin in all games, Panthers’ Kristi Harvey has been impressive all season and Norwood’s Bek McMahon shows real leadership. Sturt’s Shae Gundlach has shown her class all year, and Glenelg’s youngster Ellie Kellock has had an impressive finish to the year. It is on a sad note that we end this weeks wrap with the tragic passing of Sturt Women’s footballer Ellen Maple. Ellen tragically passed away on Sunday evening. 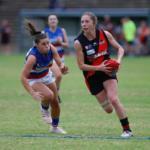 Ellen was a standout performer in the SANFLW League all season for Sturt, having previously played for Norwood. THIS week has seen preparation for the 2018 season ramp up at both the AFL and SANFL levels, with a bunch of South Australian talent on show. 2018 draft hopefuls will be looking to make an early statement on their season in trial games, while the AFL boys will be playing for bragging rights in the upcoming preseason Showdown. Meanwhile, the SANFLW competition hits the halfway mark. THIS weekend, SANFL clubs will be put through their paces with all levels participating in trial games. In last week’s shortened SANFL trial games (15 min quarters) between North Adelaide and reigning premiers Sturt, some of this year’s draft potential were on show. 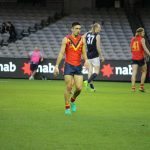 In the reserves, North got up by eight points, Boyd Woodcock was lively around the ball whilst James Langley presented well as a tall forward with limited opportunities, while also pinch-hitting in the ruck. It’s also worth noting that 2017 under 16 state ruckman Dyson Hilder, who is a 2019 prospect, also played at full-back for the first time in his career and had some rebounding plays. For Sturt, powerhouse midfielder Tom Lewis was amongst the possessions with many clearance handballs and was strong in and on the tackle. In the league game Sturt comfortably beat North, with AFL Academy prospect Hugo Munn playing up forward and crashing the contest a number of times. Coming off a BOG for the State U18 trial game, Mihail Lochwiak looked extremely comfortable at this level and showed poise and dash off half back. SANFL Womens – Halfway mark of the season The SANFLW season is now at the half way point, with South Adelaide and North Adelaide’s womens teams setting the pace. North Adelaide look to be the favourite at this stage and have some stand out performers in Katelyn Rozenweig – leading all comers with 10 goals for the season – and Jess Edwards and Becchera Palmer having impressive seasons. South Adelaide will be looking to hold onto top spot with Nikki Gore and Jaslynne Smith both showing their class to date. For Norwood, Ebony O’Dea and Leah Cutting have impressed in all games. West Adelaide’s Rachelle Martin has been in a class of her own for the Bloods, and Abbey Holmes continues to push for Crows selection. Sturt have a very young side full of local talent, and Shae Gundlach has clearly been their best so far. Glenelg have recently removed their SANFLW coach and hope for improved results with a young squad, and youngster Ellie Kellock looks a future AFLW talent. The recent round of JLT games continued to showcase a batch of South Australian talent looking to stake their claims for round one selection for their respective AFL teams. Ex-Glenelg youngster Bailey Williams looks ready for a berth in the the Western Bulldogs’ 22 after impressing in their win over Hawthorn, and Ryan Burton from Hawthorn no doubt will be one of their keys this year. Former Centrals player Nick Holman was amongst the best for Gold Coast and has slotted back into the AFL environment well. It was fantastic to see Gold Coast Sun Sam Day and Geelong Cat Cory Gregson, both getting through their first games unscathed after hideous runs with injury in the past year. Both SA lads are prodigious talents and it will be exciting to see what they bring this season. For the Adelaide based teams, the clash between Power and Crows at Alberton will no doubt be a fierce contest and it will be interesting to see team selections, especially whether youngster Darcy Fogarty can force his way into the Crows line-up, while Power recruit Tom Rockliff will have to wait for round one due to injury.